looking forward to some good racing sat. I wanna try and come out friday to practice with my stadium truck, so if you got one guys bring 'em sat and Im sure we can get a class going! Cunningham bring your truck breh! I wish the track could be open a little earlier on friday for practice, I got a four day weekend and Im sure some of you guys do too! Will there be room for stadium truck? Stock or Mod? hey jesse , did you /they mention somthing about a track change for the 1/10th side ? Will there be an intermediate 4wd class tomorrow night? All the races are run starting ariound 6 pm typically gates open at 4 night time outdoos is perfect.. Antioch in tha day time is an inferno. Delta has great lighting in the evening.. practically daylight visibility..and for us old folks its good. Come check it out this Sat.. te racing's fun and you saw the track..
Will this be a nighttime series? Will there be a track change before the first race of this series Kraig? 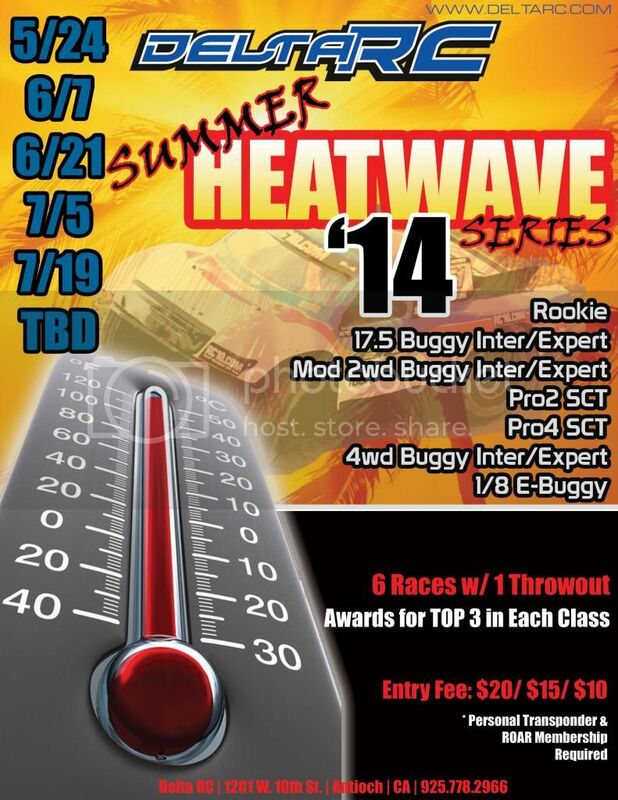 2014 Summer Heatwave Series 6 races 1 throwout. Race Dates: 5/24 6/7 6/21 7/5 7/19 Final TBD First race in 2 weeks!! I don't care if they combine it with E buggy, E truggy and nitro truggy.........lol. I just wanna run n not drive 3hrs to do it! HB D812/ FUSION X3 FM/ M11x/ LRP/ ORION R10/ B5r/ Schelle/ .........."you can always go faster"
e-buggy here. My setup can handle 10-12 minute races, should folks want to combine nitro and electric. I'm looking for the large track to open soon. We have been to 2 nitro races with very low turn out. Hoping for a good turn out when yout track is done. The last race turned into practice only. i have ZERO concerns about the big track. ken johns' tracks and surfaces just keep getting better and better (current track is way fun with great flow and awesome, consistent traction from round to round). whatever he has planned for the big track i'm sure will be awesome.